Stage Presence: Are Your Born With It Or Can You Develop It? 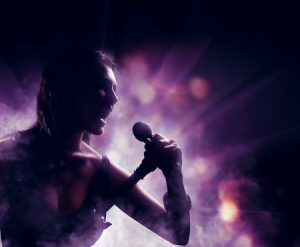 Can you develop stage presence? Yes, you definitely can. Keep in mind that sometimes it’s not so much how well you sing as it is how well you communicate a song to an audience that matters. There’s something about the exchange between a singer and their audience that’s magical or spiritual, or somewhere in between. Can they see your expressive eyes? Can they see your hands and arms moving to emphasize certain lyrics? Do they feel the emotion in your voice? Many people can sing, but it takes a little something extra to perform. Stage presence helps turn singers into performers. How Do You Develop Stage Presence? So how do you develop your own stage presence? It comes with practice, preparation, time, and watching the masters do their thing. If you want to emulate your favorite singer, go ahead and do so. Try their look and/or their moves. See what works for you and your set of songs, and what “doesn’t work.” For instance, guys might find themselves copying the look of Frank Sinatra, wearing a tuxedo and fedora on stage, and that gives them a stronger stage presence than just jeans and a t-shirt. Or girls might go for a sparkly dress or an exciting outfit like J-Lo, Miley Cyrus or Lady Gaga might wear. As a young singer, you’re apt to try on different looks and explore different styles until you find one you’re most comfortable with… and when you find “the look” and “the style” that suits you best, run with it! That helps set the stage for your stage presence development. Next, you’ll want to perform often, for anyone, everywhere, in all sorts of situations. Yes, that means wedding receptions, nursing homes, and flea markets– putting yourself in different venues and situations, as a singer, will help you learn what works and what doesn’t for you. Maybe you’ll discover a certain song just doesn’t “fit” your voice well, while another is “perfect” for it. Meanwhile, you’ll spend hours and hours getting to know who you are as a singer and what the songs you’re singing are truly saying to people. It takes time, energy, passion and more to develop your stage presence over time. The more confident you become as a performer, the stronger your presence will be, such that you will “command the room.” And when you “have the audience in the palm of your hand,” that is a great feeling; Sing Like A Star can/will help you get there. Call 404-790-1830 for more info.